Reconciliation statements are useful for business to verify the current statement of their account without any bias through a third party. For individuals who want to verify deductions or additions to their personal statement, a reconciliation statement would still be appropriate. A reconciliation statement may also help support a needs statement upon verification of the current statement balance of a business requesting for grants or funds. 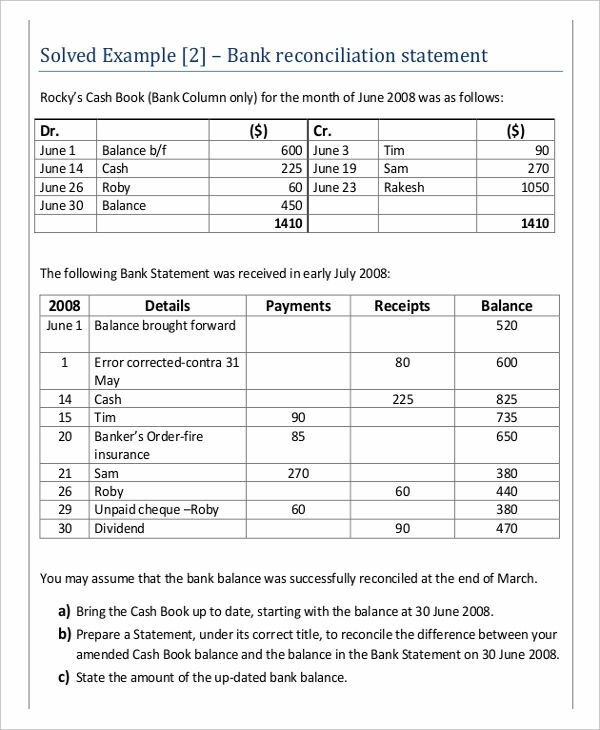 Examples found in the page may provide additional help in understanding the structure and purpose of a reconciliation statement and how a reconciliation statement can be made. A reconciliation statement is a document that verifies the truthfulness or accuracy of a company or individual’s account balance in reference to any account (usually a bank account) held by a third party. 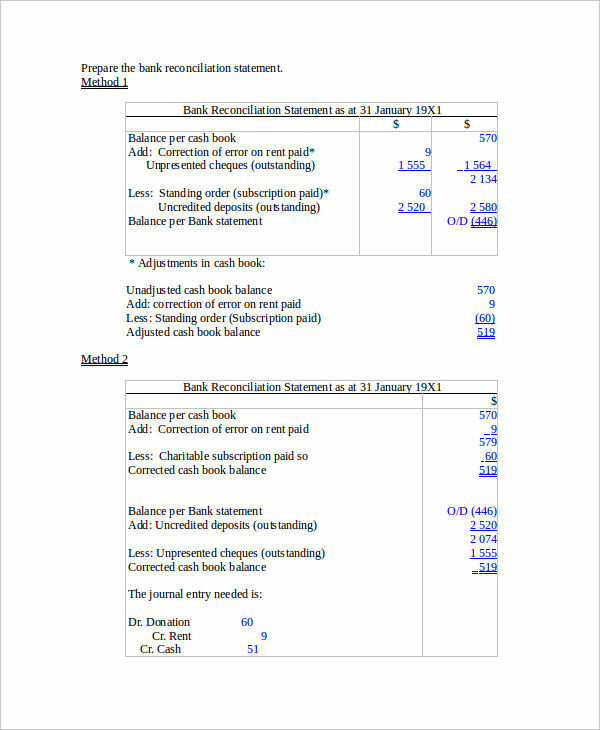 It details the differences or exactness between the two versions of the accounts. In this case, your account (maintained by you or the company) and the bank account. Impact statement examples can be made from the reconciliation statement examples shown. Just be sure to click the download link button below the sample to get a closer look. 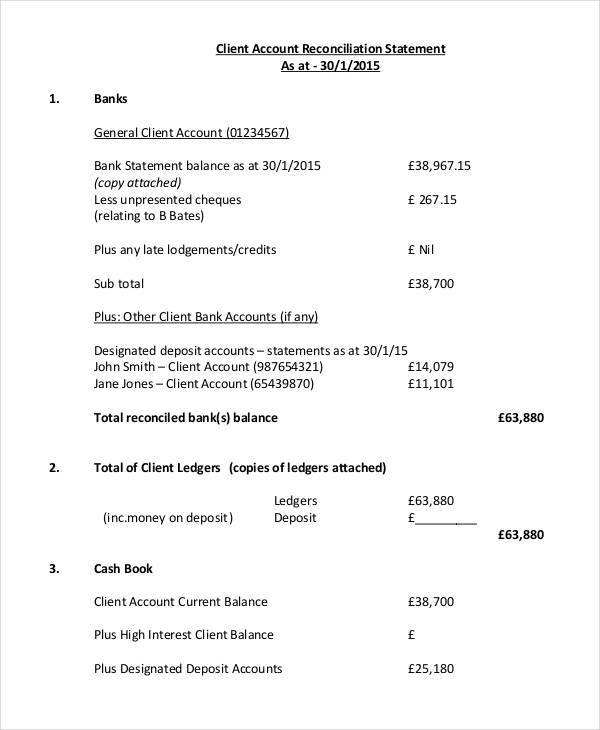 A schedule or list with the ending cash account balance on your business or personal ledger. This includes all activities done on the same day or duration in time as the bank account balance. 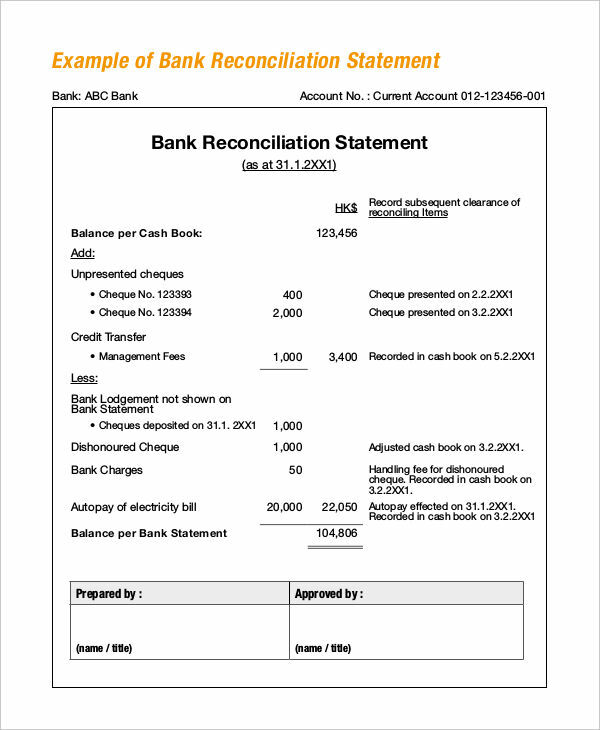 Statement examples in excel shown in the page provide further information regarding the making of a reconciliation statement. Feel free to click and download on a sample to access the file. 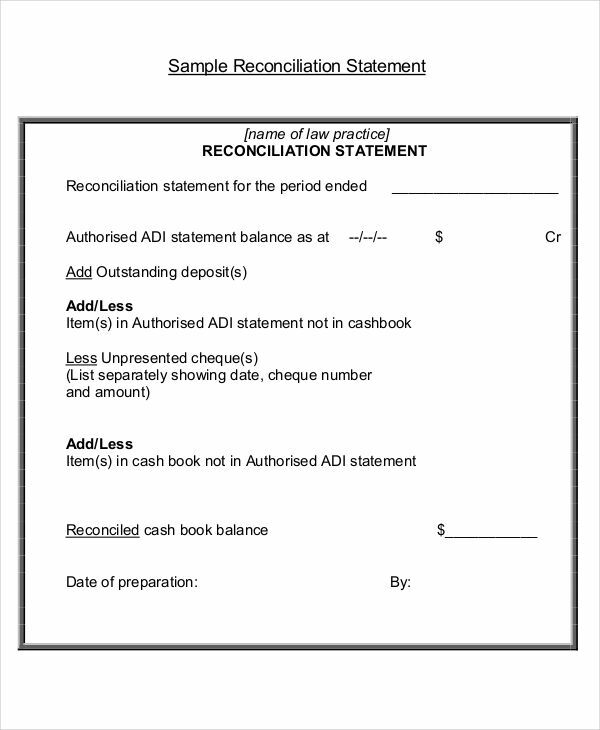 What Is the Purpose of a Reconciliation Statement? Accounts of Debt – Done for reconciling or comparing the debt amounts that are outstanding to the record that a lender has. Differences usually are seen as it also depends on how regular or updated the statement analysis of accounts a lender has. 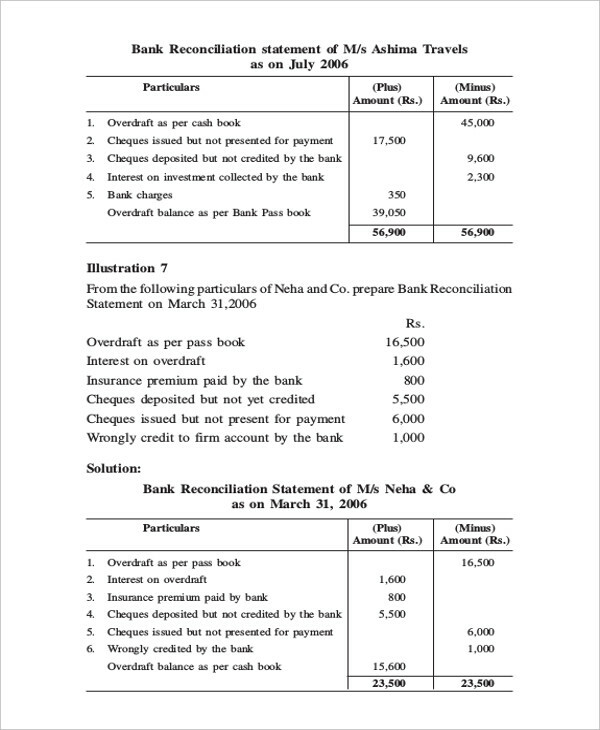 Bank Accounts – Bank reconciliation intends to balance the company’s current cash balance and the bank account balance. This is done on the same day as a bank regularly updates bank account balances. Accounts Receivable – Made for individual customers of a company to compare their outstanding receivable balances and that of the record of the company. Accounts Payable – In the same context with an individual customer’s receivable, the customer payable balances are compared to the company’s record of payable balances to that customer. Either way, a reconciliation statement usually brings out the differences in the time when an institution, lender, or customer updates their accounts. It may also sometimes record discrepancies in the recording of a transaction helpful to both parties involved.